Orogold 24K Deep Peeling. Cosmetic quackery? 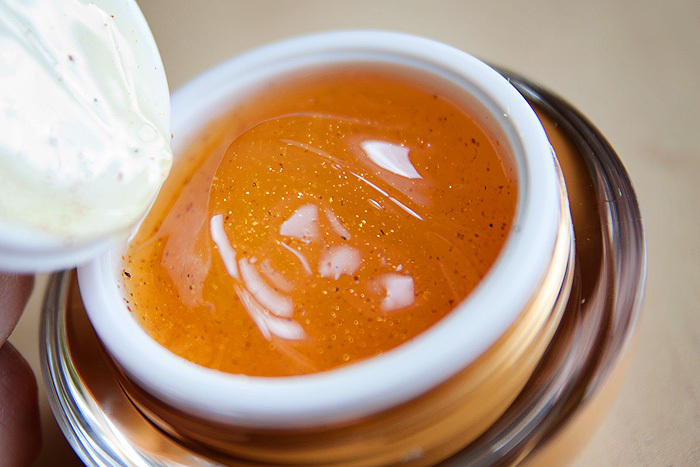 If you’ve been following me for a little while, you may already know my thoughts on the use of gold in skincare. Ultimately, I believe it’s an addition that’s far more beneficial to the marketers than the end user… it’s not a mineral enriched with healing properties, it’s a metal, prized for its stability and inertia. But boy, does it pack some prestige and “luxury” into a product, no? 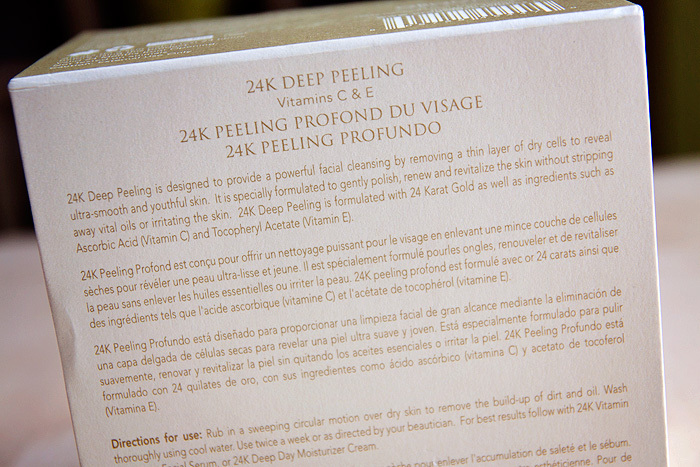 I was sent a beautifully packaged 24K Deep Peeling gel from Orogold Cosmetics for review… it really is a rather splendid thing. Priced at £100… I guess it should be. The heavyweight packaging, embossed font, and satin-lined box all scream luxury… living up to its placement and price tag. But what about the product inside? What are its claims and does it live up to them? 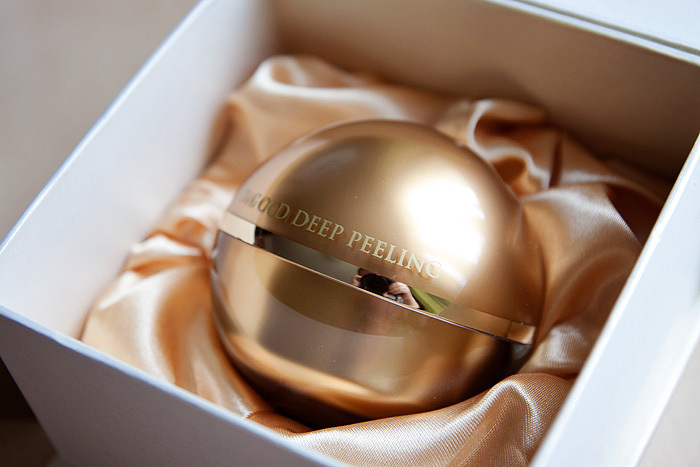 Orogold Cosmetics 24K Deep Peeling is an exfoliating product that promises to remove a thin layer of dead skin cells to “reveal ultra-smooth and youthful skin”. It is recommended to be used once a week with a “sweeping circular motion over skin until you feel the dirt forming”. Oddly, there is no mention on the website of the 24k gold that this product contains. Considering that this is such a selling-point and no doubt a price justification… I’m surprised to see that the brand have omitted this information online. 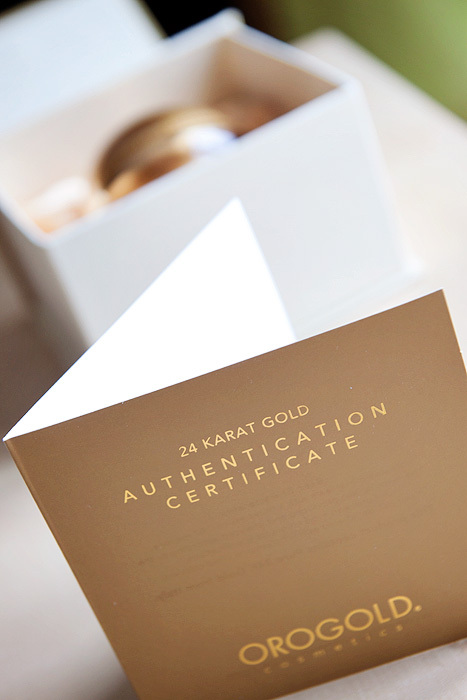 Each pot of Orogold 24K Deep Peeling comes with its own certificate of authenticity (I told you the packaging was good). 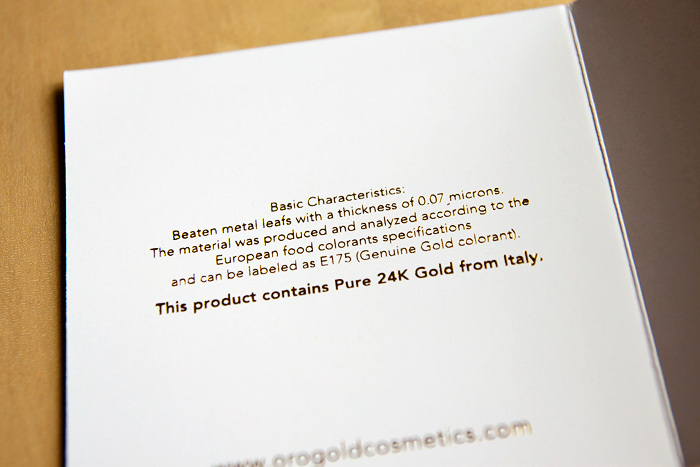 The certificate proclaims that the product contains pure 24K gold from Italy. And you know, it really does… it contains food-grade gold leaf. Very pretty to look at but at that size, unlikely to have any impact on your skin. You’d need pores the size of moon-craters to benefit from any of its so-called properties. To put it another way, the thickness of gold leaf is rated at around 125nm and anything rated above 40nm has been shown not to be able to penetrate deeper than the upper 1/5 layer of the epidermis. This gold ain’t going nowhere except down the plug-hole. So, I’m obviously not convinced by the gold. But what about the peeling? How about the exfoliation? 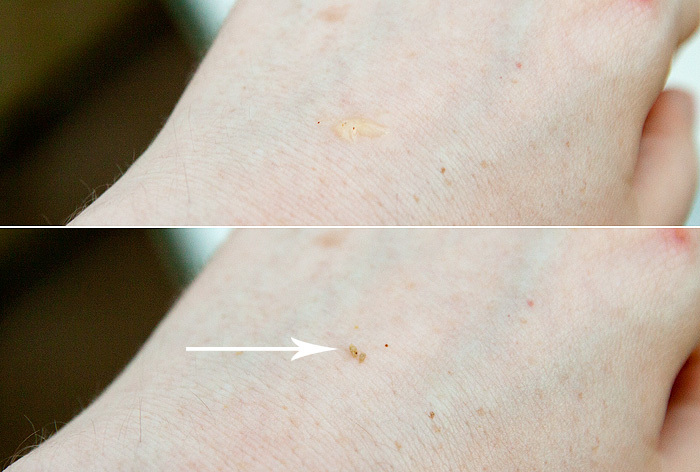 To create this kind of “balling up” upon application, you need to create a chemical reaction on the skin. Two such ingredients that will create this effect are: cetrimonium chloride and carbomer… both of which are present and correct in Orogold’s 24K Deep Peeling. Clever huh? Now just because I’ve (semi) explained the science behind the “magic” doesn’t mean that it’s all smoke and mirrors. Those little flakey bits will actually help to gently exfoliate your skin as you massage them over your face and let’s not forget the other ingredients contained within the exfoliator, namely: tocopheryl acetate (vit e), ascorbic acid (vit c), and glycerin… all of which will indeed help to smoothe and soften the top layer of the skin. That being said, it’s a very gentle exfoliation and I’m not sure how effective it would be in the long term if used only once a week as per their direction on the website. 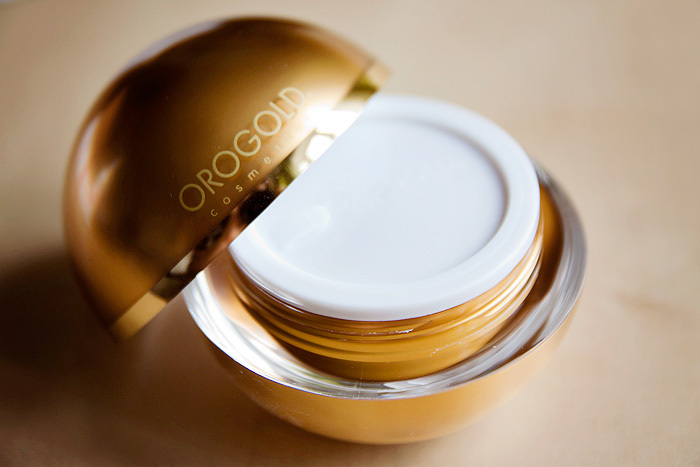 All in all, Orogold 24k Deep Peeling is an exfoliator that works to errr, exfoliate. I won’t deny that it feels nice on the skin, looks the business in the pot, and leaves my skin feeling soft but… is it worth £100 of your hard-earned cash? I wouldn’t pay more than £10 for it – gold or no gold.